Summary: Microsoft Scripting Guy, Ed Wilson, shows four ways to create folders with Windows PowerShell, and he discusses the merits of each approach. Hey, Scripting Guy! I am trying to find the best way to create a new folder while using Windows PowerShell. I have seen many ways of creating folders in scripts that I have run across on the Internet. They all seem to use something different. Is there a best way to create a new folder? 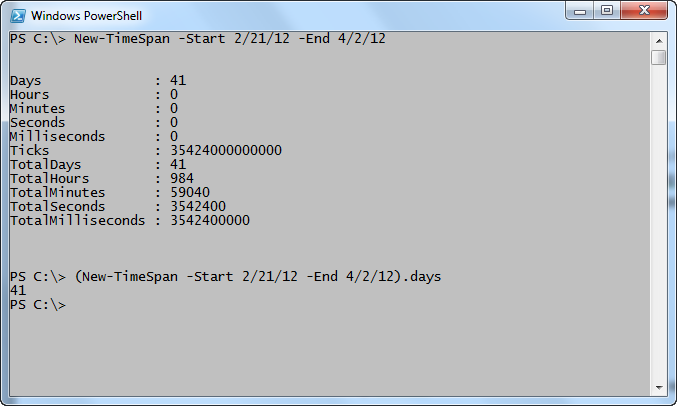 Sure enough, the returned TimeSpan object tells me that there are indeed 41 days until the 2012 Scripting Games. I decided I would like a cleaner output, so I used one of my Top Ten Favorite Windows PowerShell Tricks: group and dot. The revised code is shown here. Both of these commands and the associated output are shown in the image that follows. It is possible to use the Directory .NET Framework class from the system.io namespace. To use the Directory class to create a new folder, use the CreateDirectory static method and supply a path that points to the location where the new folder is to reside. This technique is shown here. When the command runs, it returns a DirectoryInfo class. The command and its associated output are shown in the image that follows. I do not necessarily recommend this approach, but it is available. See the Why Use .NET Framework Classes from Within PowerShell Hey, Scripting Guy! blog for more information about when to use and not to use .NET Framework classes from within Windows PowerShell. 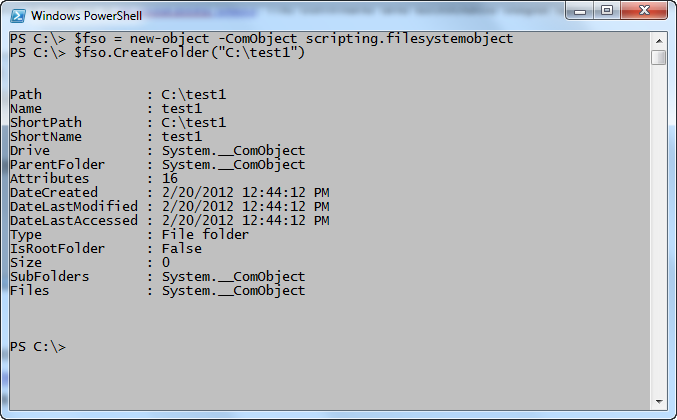 Another way to create a folder is to use the Scripting.FileSystemObject object from within Windows PowerShell. This is the same object that VBScript and other scripting languages use to work with the file system. It is extremely fast, and relatively easy to use. After it is created, Scripting.FilesystemObject exposes a CreateFolder method. The CreateFolder method accepts a string that represents the path to create the folder. An object returns, which contains the path and other information about the newly created folder. An example of using this object is shown here. This command and its associated output are shown in the following image. GW, it is also possible to use native Windows PowerShell commands to create directories. There are actually two ways to do this in Windows PowerShell. The first way is to use the New-Item cmdlet. This technique is shown here. The command and the output from the command are shown here. Compare the output from this command with the output from the previous .NET command. The output is identical because the New-Item cmdlet and the [system.io.directory]::CreateDirectory command return a DirectoryInfo object. It is possible to shorten the New-Item command a bit by leaving out the Path parameter name, and only supplying the path as a string with the ItemType. This revised command is shown here. Some might complain that in the old-fashioned command interpreter, cmd, it was easier to create a directory because all they needed to type was md––and typing md is certainly easier than typing New-Item blah blah blah anyday. The previous complaint leads to the fourth way to create a directory (folder) by using Windows PowerShell. This is to use the md function. The thing that is a bit confusing, is that when you use Help on the md function, it returns Help from the New-Item cmdlet—and that is not entirely correct because md uses the New-Item cmdlet, but it is not an alias for the New-Item cmdlet. The advantage of using the md function is that it already knows you are going to create a directory; and therefore, you can leave off the ItemType parameter and the argument to that parameter. Here is an example of using the md function. The command and its associated output are shown here. You can see from the image above that the md function also returns a DirectoryInfo object. To me, the md function is absolutely the easiest way to create a new folder in Windows PowerShell. Is it the best way to create a new folder? Well, it all depends on your criteria for best. For a discussion of THAT topic, refer to my Reusing PowerShell Code—What is Best blog. GW, that is all there is to creating folders. Join me tomorrow for more Windows PowerShell coolness.